Premium Compatible Label Tapes for the Brother P-Touch QL570 printer. Brother P-Touch QL570 is a thermal transfer monochrome printer designed for both professional as well as domestic use. It is a compact single-function device with quite a small footprint that makes room even on a small table. Brother P-Touch QL570 printer is integrated with thermal printing technology that makes it fast at work without making much noise. Better than that, it doesn't involve a tedious task of replacing ink cartridges. Coming to the speed, it prints at 68 labels per minute which makes it ideal for those who use it on daily basis for shipping, mailing, CD/DVD printing or any kind of administrative operation. A bonus advantage for home users is that the printer offers fun templates that makes task enjoyable while using it to organise homes. The device comes with an in built automatic cutter and status LED. For die-cut labels the cutter sustains up to 300,000 cuts and for continuous labels it offers 150,000 cuts. The printer is compatible with a wide variety of Brother P-Touch QL570 Label Tapes including standard address labels, shipping labels, file-folder labels and white paper continuous roll. It facilitates label printing up to 2.4 inches width. The maximum resolution corresponds to 300 × 600 dpi which provides sharp legible texts as opposed to providing unclear dark images. Brother P-Touch QL 570 is accommodated with 3 label printing modes namely Snap, Express and Professional making it a user friendly software. It works only when connected to PC over USB. Besides, it is compatible with Mac system. Brother P-Touch QL570 printer's excellent printing speed, easy synchronization with different labels, delivers it as a perfect choice for both small but heavy duty business applications and home applications. But the device would be rather expensive if not used for daily printing. So it's important to choose this printer accordingly. Q. When I try to print using my Brother P-Touch QL 570, some parts of the label remain unprinted. However, the screen displays the printing correctly. What could be the problem? A. Please open the Print dialogue box on the screen and make sure the "Output Directly to Printer Driver" option is 'On'. You might encounter this kind of printing problem with some of the computers if the setting is off. Besides, this option serves you best when you need to print labels in bulk without any delay. If this problem still persists please contact Brother customer support for other detailed instructions. Q. Is there any way I can save on my Brother P-touch QL 570 label tapes while printing? I always notice that an excess of label tape at the beginning and at the end of a label print is unnecessarily used. Is there anyway I can stop this wastage? These options will help you in saving the Brother P-touch QL 570 label tapes and reduce wastage considerably. Q. Is there any option to connect Brother P-touch QL 570 to my android smartphone for printing? A. Unfortunately Brother P-touch QL 570 cannot connect to smartphone as wireless connectivity is lacking. Instead, you can use the USB port to connect to your Windows or Mac computers provided the Brother printer driver is installed. Q. The labels have jammed inside the printer. What should I do to prevent this kind of a situation in future? I use Brother P-touch QL 570 label tapes. A. First of all please open the roller compartment and ensure there is no dirt on the roller. Dirt or lint usually jams the labels. And if the roller is dirty please clean it carefully using a cleaning sheet that comes along separately with the label printer (do not use cleaning sheet that belongs to some other label maker as that may lead to malfunction). To know more in detail about to clean the roller using the cleaning sheet please refer the user manual or the Brother support site. Hope this resolves your issue. Q. Hi. I use Brother P-touch QL 570 label maker to organise my household things. I just wanted to know can I use the Brother P-touch QL 570 label tapes after I've already used it to label things? I mean is it reusable in anyway? A. Hello. The Brother P-touch QL 570 label tapes come with a permanent adhesive. Once if used, the labels cannot be removed and used on other things. However, if there are no chances of your things getting spoilt you can try reusing the labels on them carefully. Otherwise it is not recommended to reuse self-adhesive labels. Q. 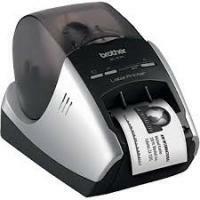 Does your website provide free delivery on purchase of Brother P-touch QL 570 label tapes? A. Sorry. We do not provide a free delivery as we deliver all our orders through the Fastway Couriers. Our delivery charge is £1.99 inclusive of VAT.